It’s Never Over ‘Til It’s Over! What makes Acey-Deucey the best game ever is that you can be miserably behind and still end up winning. 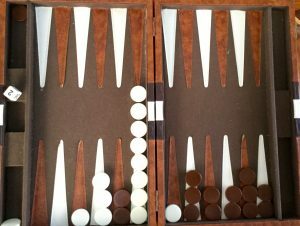 The biggest reason for this is that, unlike regular backgammon where you get to take off any pieces with the number of your dice roll or lower, in acey-deucey, you only take off from the places of your roll. Case in point – playing Rand this morning while we enjoyed our morning coffee. Right from the beginning, within a few rolls, Rand appeared to have crushed me, blocking me so I was getting stuck in my beginning board, his home board. Strategically, my best chance was to block off as many of the higher numbers of his home board spots, forcing his pieces into the 1 & 2 spots, which is a tough position to take off and end the game from. It was looking bleak for me. I’m the white checkers, barely out of my home board (lower left) while Rand has had so many doubles and acey-deucey rolls, he’s advanced all the way around the board to pressure me. And then, I got a few lucky 6 rolls myself, allowing me to advance past his five blocked spaces. Turnabout. And I ended up winning. We can play acey-deucey every day and no two games are ever the same, or ever lack for suspense and challenge. We highly recommend acey-deucey to all solid couples who can handle some competition. In case you’ve never played acet-deucey before, here is how you do it. Setup: Each player starts with fifteen checkers off the board. The players enter their checkers in the opponent’s home board, then bring them around the board as shown in the diagram below. Object: The object of the game is to move all of your checkers around the board to your own home table and then bear them off. The first player to bear off all of his checkers wins the game. Entering checkers: You enter a checker by placing it on a point in the opponent’s home board corresponding to a number rolled. For example, if you roll 6-3, then you enter one checker on the opponent’s six-point and one checker on his three-point. Once you have entered one or more checkers, you may use subsequent rolls to move those checkers forward, to enter more checkers, or both. If the number rolled is another 1-2, you keep going—naming and playing a double of your choice, and then rolling again. Entering from the bar: Any time you have one or more checkers on the bar, your first obligation is to reenter those checker(s) into the opponent’s home board. You reenter a checker by moving it to an open point corresponding to one of the numbers on the rolled dice. If you are able to enter some but not all of your checkers on the bar, you must enter as many as you can then give up the remainder of your turn. Bearing Off: Once you have moved all fifteen of your checkers into your home board, you may begin bearing off. You bear off a checker by rolling a number that corresponds to the point on which it resides, then removing the checker from the board. Scoring: The loser pays one point for each of his checkers still on the board (or yet to be entered). Gammons and backgammons do not count extra. 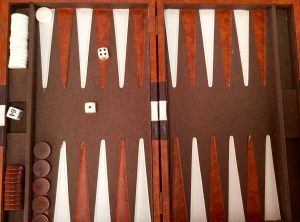 Strategy: Because the roll of 1-2 is so powerful, luck plays a greater part in acey-deucey than in regular backgammon. You are never completely out of a game. On the other hand, since you start with fifteen men back, there is some added opportunity for skill in placing your checkers to block the opponent. Hi, we are addicted to King’s Cribbage. Great when we are stuck on the boat, with high winds like now. Check it out. It’s an Aquarian thang I guess with those doubles, Ellen. You Gem’s must resist temptation to hide pieces under your chair and reside to usually doing the dishes.